a company born out of frustration with the lack of satisfactory services available. In 2006 our sister company, Technicalities, moved into a new, high-tech facility in Moorabbin. Technicalities needed high-speed fiber broadband to provide quality service to its growing list of hosting clients, however the cost of installing the fiber was prohibitive. The solution? Technicalities applied for a Telecommunications Carrier License and Fiber Vision was born. 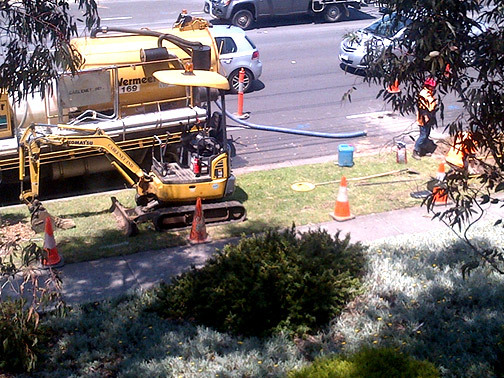 We built our own infrastructure and today we have a 2.5 km backbone of single mode fiber in road reserves around Moorabbin and Heatherton, areas traditionally serviced by unreliable and overpriced fixed wireless ISP’s or Telstra. This background in providing IT solutions for business has provided us with true insight into the needs of our clients – why they need fiber optic broadband and the IT infrastructure they’re using to connect to it. This understanding can be seen in the little things we do such as out-of-ours migrations, minimising business disruption. In some instances we can even install an obligation free trial of the service to prove its efficacy in addressing VPN drop out and remote access problems that branch offices and home teleworkers face. Our Network uses Cisco ASR9900 series core routers and Cisco ME3600 gigabit Metro Ethernet switches. Our customers have ME3400 switches, which are also gigabit capable, depending on the SFP module used. We carry pre-configured spare parts for all core equipment so that in the unlikely event of failure, we’re ready to get to work and fix the problem, so you can get back to business. Plus, even if you’re outside our network footprint, you can still receive our brand of service, utilising Telstra Wholesale’s “Ethernet Access” network.